Students can practice up to 5 days a week; however, we recommend at least 2-3 times a week. Please make sure to pick up your child no later than 5 minutes after class because the next class will be starting. To qualify to test, students must practice at least 8 times a month (for 3 consecutive months). the student will have to wait one more additional month to test because of attending 7 classes in the third month only. · White to Yellow belt- when your Instructor recommends you to test. · Yellow belt and up- you will test every three months. · Red belt 2 Stripes to Red/Blue belt- you will wait 6 months. · Red/Blue belt to Red/Blue belt with 1 Stripe- you will wait three months. 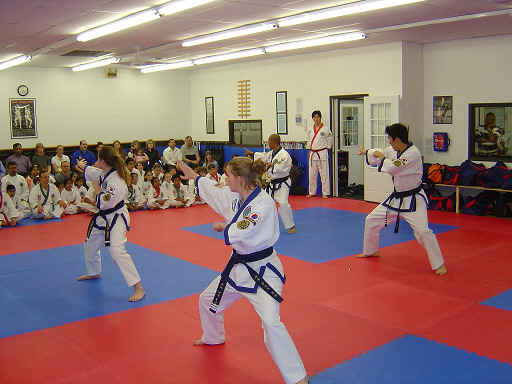 · White belt to Red/Blue belt with1 stripe: Each belt test fee is $55 or $60testing occurs once per month. Tests are usually held the first Friday of each month. After passing the test the belt will be given on the same day. The belt certificate will be ready around 3-4 days later to pick up. Belt tests require an oral portion that is different for each belt test. The information is in the student handbook or on the school website under the federation web page. Please make sure to study this because if a student does not pass this section of the test he or she will not pass. The student will then have to retest the oral part on a later day. 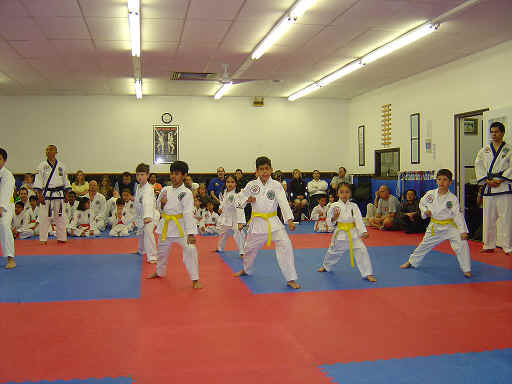 The Black Belt test is only offered twice a year in March and September. I am writing this to help reduce confusion over when testing occurs, and how often a student can test. The simplest way to answer is if the student brings home a test form, that means he or she is ready to test for the next belt rank. Here are some of the criteria used to determine if a student is ready to test. The student must practice at least 8 times per month for three months. There are some minor differences for a few belt ranks, but this is the general rule. This gives the student adequate time to learn and practice new skills need to progress to the next rank. It must be noted that attendance is not the only criteria. The instructor must watch each student's performance and determine if they are ready. In the week or so prior to a scheduled test, instructors will look to the attendance cards to see who is eligible to test. These students are watched more closely, and in some cases receive instruction separate from the main class. Once the instructor determines the student has adequately learned the new skills, a test form will be given to the student. If you don’t remember to put your card in the card slot, we cannot count your card next day or on a later day, you (or parents) are must remember to put your card in when you come to practice. Please do not bring your card to the office and ask to be credited for another day. Please do not adjust your (or your child) card. There are no exceptions. 8 days is minimum amount for class per month. Even when you are attending 8 days per month, some students wishing to test have been attending the last available classes in the month jus to meet the minimum. In the future, if students only attend that last available classes you still may not test. It is up to Master Kim discretion when a student is ready to test. But your techniques are not good you will not test.